Alev Karagulle at Burgess tells me of two new central agencies recently signed for sale. 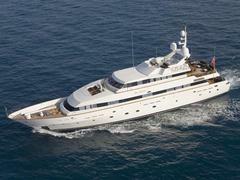 Firstly, their charter central agency Siar Moschini's 43m Sea Dream is now on the sales market. Built in 1991 and refitted in 2006, she's been a popular choice with charterers and has been well maintained throughout. Accommodating 10 guests in three doubles and two twins, she has a separate dining/conference room and spacious deck areas with Jacuzzi and is asking $12.95 million. Then there's Benetti's 35m Felidan, sold by Burgess in May 2009 and now back on the market asking €5.3 million. Built in 2000, she too has a strong charter record and sleeps eight guests in a master, VIP and two twins. Fully repainted in 2007 and with a stylish Francois Zuretti interior, _Felidan _has a cruising speed of 15 knots and a range of 2000 nautical miles at 12 knots.